Once upon a time I happened to be student at Cork Institute of Technology in Ireland. I got there as Erasmus-Socrates exchange program student and I was suppose to stay there whole year. I attended 4th year of electronic engineering course and part of this course was subject called Engineering design project. With bit of (Irish) luck I managed to be assigned quite cute project, on which 3 students failed before me, so I had really glorious prospects :-). 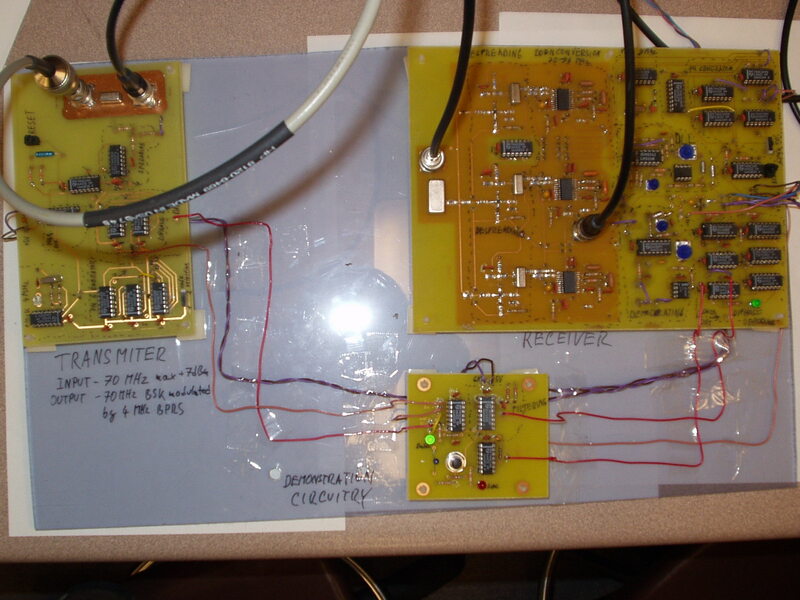 Project specification was quite simple: to build transmitter and receiver, which will use spread spectrum direct sequence, based on some ancient article by James Vincent published in ELECTRONICS WORLD + WIRELESS WORLD in 1993. Article could be found for example here. When I got a bit into the matter I realized it won't be so simple, moreover that I will be happy if I manage to do at least part of it. 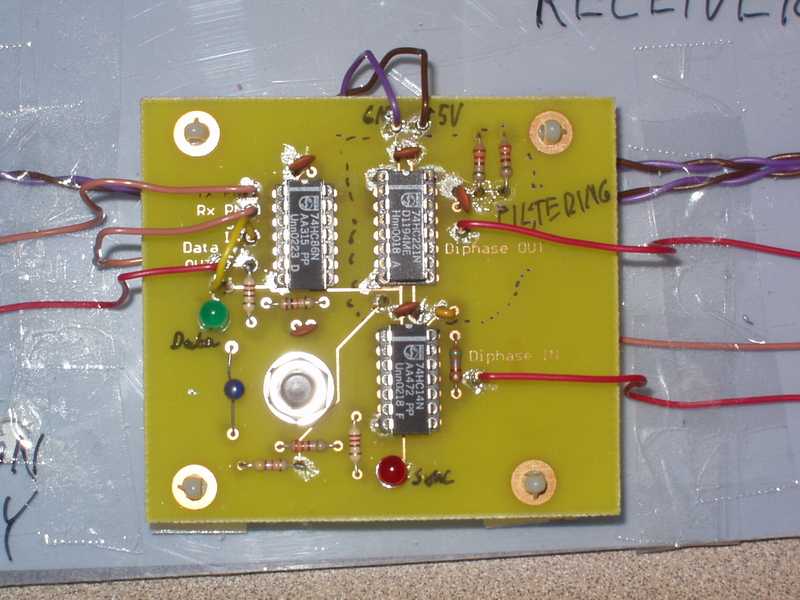 During my desperate searches though internet for more info, I found , that this article is fairy popular, but nobody has real working solution, with enough documentation to reproduce the circuit. I had no option than to start from scratch. 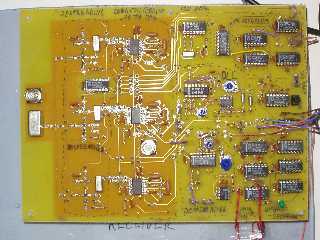 If you're are in similar situation and some mad professor is driving you into building this museum piece of electronic or if you're just interested in some practical issues when building such a system, I hope my documentation will be helpful. Just to give some idea what my "product" looked like, there're few photos. 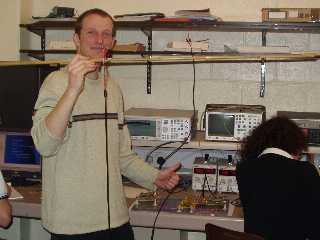 Whole system plugged in and in operation plus happy inventor holding 70MHz half wavelength dipole antenna. Most of the time I used two signal generators (one for 70MHz carrier and another for 64MHz mixing frequency), then digital scope, spectrum analyzer, two power supplies (+5V and +12V) and common multimeter. In the picture there is one antenna fixed on the shelf behind me and I used another one in my hand to play around. Project report (pdf file 2.8Mb) This is my OWN written project report. About 80 pages. 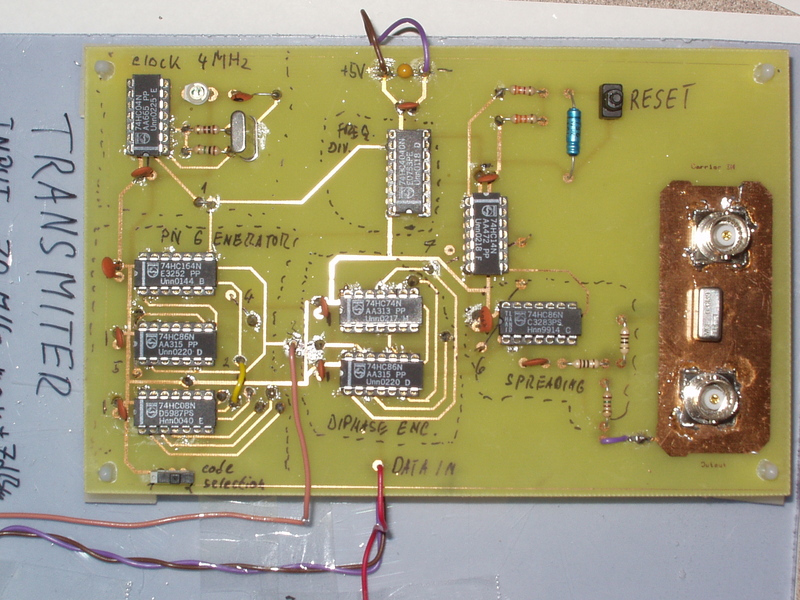 Apart from detailed description of circuit and the way I managed to get everything together, it also contains original article by James Vincent (of course I have no copy rights, so I hope nobody will sue me for millions :-) ). Original article Original article by James Vincent on Tarp Spread Spectrum web page. OrCad simulation Before I started building my circuit I tried to do few simulations. Unfortunately most of the RF circuitry cannot be easily modeled and in fact there are NO models for OrCad of such components as modulator, crystal (I found few, but quite shity) , amplifier , filter and even some of the basic TTL logic (monostables). Anyway even if you model these components using ideal mathematical function (like multiplying for modulator or some Laplace transform for filter), the simulation (I mean transient one , in which you would be probably interested) is likely to take up couple of days and hundreds of gigabytes of disk space. In other words, for normal guy like me, with no background of multinational company with own specialized simulation software , it's quite impossible to simulate such a problem and it's better to start straight experimenting with real circuit. Unfortunately it took me couple of months before I discovered this ;-). Anyway I produced few messy OrCad simulation. 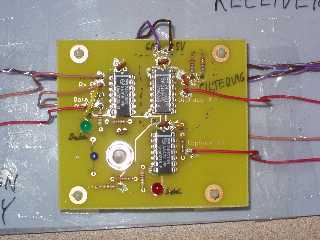 It contains quite nice working model of transmitter , then there are few parts of receiver, but only those with simple components, which I had model for. As I said before my archive is quite messy, so you'll probably won't be able to tell what it is all for, don't worry neither do I :-). Other usefull documents There are plenty of other documents I concidered to be handy during my desing. 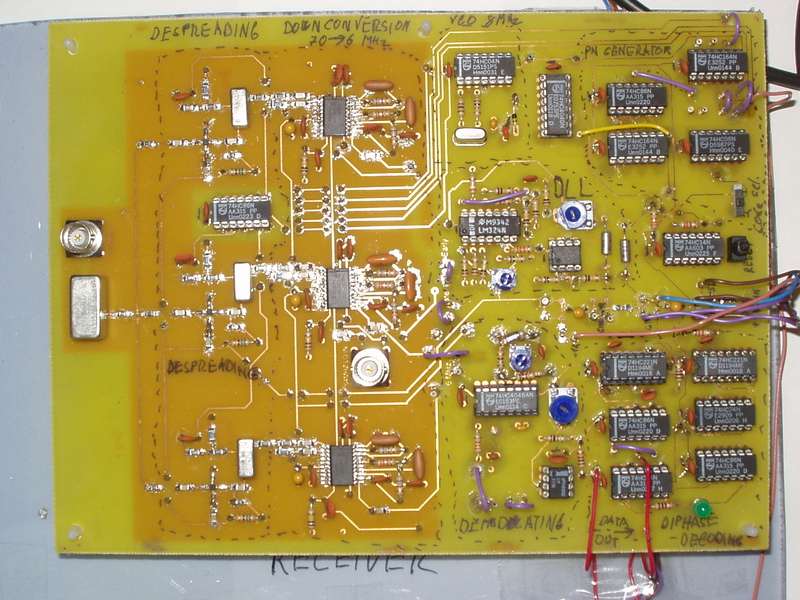 It contains datasheets of crucial componets (mixers, amplifiers, SA605 chip, PLL, etc.) , few theoretical papers about spread spectrum and my Bill of Material (quite long list with strange numbers :-) ). Farnell Electronic component distributor. I got most of my componets from them. 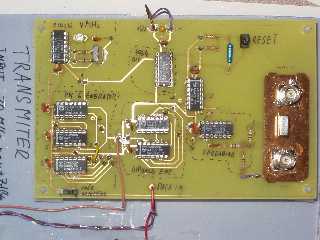 Mini-circuits US manufacturer of RF components. All my RF stuff comes from this company.